Eelus is a mysterious stencil artist born in 1979, who began his commercial career at the age of 9 when he started selling hand-drawn pictures of the ‘Teenage Mutant Ninja Turtles’ for 5p in a Wigan primary school. 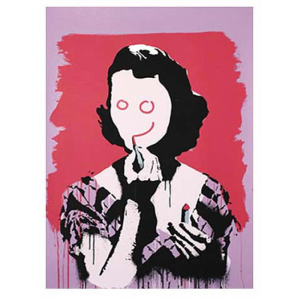 His work is often both beautiful, memorable, comical and sinister with a daring mixture of light and dark. After moving to London 10 years ago, Eelus was almost instantly snatched up by master printmakers Pictures On Walls. He later graduated to drawing various monsters and dinosaurs, describing his college portfolio as ‘pretty similar to what you’d find under a serial killers bed’. He realised his college tutors were wrong and there could be a chance he could make a living from painting pictures, and decided to throw away the towel in on his design career and never looked back since. 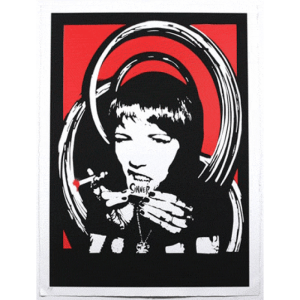 In the last couple of years, Eelus temporary absence from the street has not reflected his absence from the scene and has taken part in a number of highly successful group shows in London, Los Angeles, Atlanta as well as being asked to paint in Japan and New York. He has done some project for Green Day and has worked and exhibited alongside the world’s best contemporary masters. However, Eelus is a master of the modern graffiti art world, and he has combined his background in design and illustration knowledge with images of sci-fi and B-movies. Eelus was inspired by the graffiti art he saw on the streets and that has ever since influenced him to display his own style of work to a wider audience. In 2006, he gave up his day job and is now working full time as a graffiti artist.